I have for long been dreaming that India will someday win ONE Olympic gold. With our population, someday, will come a stud boy who will be born with gills, and a shark's tail and fin. He will swim faster than others, or at least eat up the faster ones and eventually win the medal. Abhinav Bindra became the first ever Indian to win a gold medal at the olympics. All the gold medals India got before were in Hockey which is a team event. 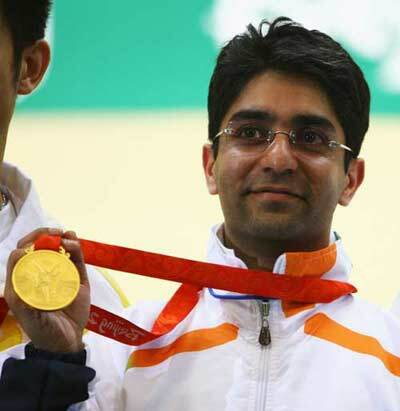 Bindra wins Men's 10m Air Rifle goldThis creates a history in Indian Sports. Abhinav Bindra's Scoring / shooting sequence was 100, 99, 100, 98, 100 and 99. Congratulations Abhinav Bindra for winning the GOLD MEDAL for India. The First Olympic Gold Medal Won by India was in 1928 Olympics in hockey. India defeated the host country Holland 3-0 in the finals. Legendary Dhyan Chand scored two goals in the final. Indian goalkeeper Richard Allen had the unique distinction of not conceding a single goal throughout the tournament. The gold medal won by the Indian hockey team in 1928 was the first Olympic gold medal won by Asia in the modern Olympics. India has won a total of eight gold medals in hockey at Olympics. From 1928 Amsterdam Olympics to 1956 Melbourne Olympics India won six consecutive gold medals at hockey. The two other gold medals for India came in the 1964 Tokyo Olympics and the 1980 Moscow Olympics. But I have a Question .. Why Do you think that even with such a large population, India Still can't produce Good Enough Athletes to excel in the fields of Sports ?? While we wait for that to happen, we should use our present resources to try and win a medal. The operative word is 'leverage'. In a country where great athletes like Major Dhyan Chand Singh die in poverty, there is no hope for budding athletes, and given the present international scenario, you have to give up your job and prepare full time in order to excel.